We've seen the top sub-$500 race cars from the Altamont October '07 race, the Thunderhill December '07 race, and the Altamont May 07 race, and now we've got the top cars- in fact, just about all the cars- from the 24 Hours of LeMons South event last weekend. The sequence of winners from those races goes: BMW E30, Mazda Protege, Acura Integra, Mazda RX-7. You can look at the official race results here, and be sure you make the jump to see all the race machines in their low-budget glory. 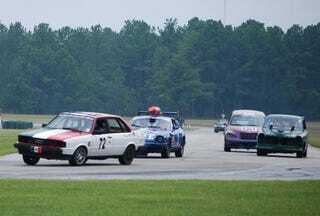 At LeMons South, the top two cars were Mazdas and the next two were Chevrolets. Light weight and power versus torque and reliability, with the former winning by a nose (the spread between the first-place RX-7 and the 4th-place Camaro was only four laps. We'll be putting up our traditional Uber Gallery (with an individual gallery of photos for each car that manage to put tire to track) pretty soon, so keep checking back!